The drinking water that most Delhiites are getting at home has been found to be contaminated with sewage water and could be harmful to health. 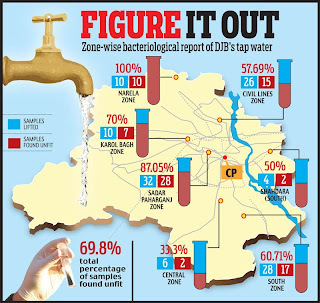 A shocking 81 out of 116 samples of such water - it translates to almost 70 per cent - supplied across the Capital by the DJB have failed a purity test conducted by the Municipal Corporation of Delhi (MCD). It is an established fact that guzzling water in the summer is the best way to stay hydrated so that lost fluids can be replenished and heat-related illnesses kept at bay. But the MCD study, on the contrary, concluded that the tap water flowing through DJB pipelines could itself be the cause of various water- borne diseases. The water samples were collected by the civic authority's public health department laboratory in May. And the bacteriological report submitted recently contains some alarming details. In upmarket south Delhi, which houses the Capital's toniest addresses, impurities were detected in as many as 17 out of 28 water samples. The posh colonies getting a deadly cocktail in their taps included Green Park, Hauz Khas, South Extension, Safdarjung Enclave and Greater Kailash. The polluted sample score was a staggering 7 out of 10 in west Delhi's Karol Bagh zone, while 28 out of 32 samples were not up to the mark in Paharganj zone which covers the Walled City. The Civil Lines area of north Delhi, too, did not fare much better as 15 out of 26 samples failed to meet the purity norms. Delhi University and the region around it are located in this zone. But the residents of Narela in northwest Delhi appeared to be the worst- off because the water quality of all 10 samples tested there was found to be poor. By comparison, the situation was slightly better in the central zone, which comprises areas such as Lajpat Nagar, New Friends Colony and Maharani Bagh. Here, two out of six samples couldn't pass muster. Around 60 per cent Delhiites consume DJB water. The others reside in resettlement colonies and bank on hand- pumps or water tanks. The MCD report is also significant because 79 cases of cholera - a waterborne disease - have been reported in the city well ahead of the monsoon. Wazirpur councillor Mahendra Nagpal, the Leader of House in North MCD, said he was flooded with complaints regarding the quality of water from many localities. " The people said the sight of the water flowing from their taps was making them feel like throwing up. According to them, the water appeared to be laced with sewage and was muddy brown in colour. Now, the results of the test conducted by us confirm their apprehensions." Former chairman of MCD's public health committee Dr. V. K. Monga said a poisonous bacteria count of up to 10 was permissible in a sample of 100 millilitres of water, according to Indian standards. " If the bacteria exceed the limit, they can cause gastrointestinal diseases such as typhoid, cholera, gastroenteritis and jaundice," he disclosed, adding that the norms abroad were much stiffer. Dr Anoop Misra, Director, Centre of Internal Medicine, Fortis Hospital, revealed: " The water becomes contaminated by a bacterium called E. coli ( Escherichia coli ). A high E. coli colony count can cause fever, nausea, vomiting, gastroenteritis and gastric intestinal inflammation. Infection can reach the blood stream in the latter instance, from where from it can affect any organ of the body." Experts also cautioned that contaminated water could cause serious illnesses, not only if is consumed as drink, but also if it is used for washing, bathing and cleaning. DJB officials explained away the shocking state of affairs by saying that the pipes supplying water in many areas of the city were old. At many places, they passed through drains. These worn out pipes carrying potable water had developed micro- cracks. As a result, the risk of waste and sewage water from drains seeping into pipes supplying potable water could not be ruled out in some cases, a board official said. Dr Monga said the contamination was owing to the excessive presence of the coliform group of bacteria, which were found only in water contaminated with sewage. The DJB, however, expressed serious doubts about the water tests conducted by the MCD. DJB spokesperson Sanjam Cheema claimed that the report had not been received as yet. Asked about the steps taken by the DJB to ensure water purity, she replied: " The DJB takes 400 random samples from different places in the Capital daily. We have our own mechanisms in place to ensure that the people get good quality of water." But Dr Monga said that last year the MCD had pointed out leakages in water pipelines at around 1,000 spots which were a major source of contamination. The situation arises since sewage and water pipes are laid next to each other in Delhi. The water and sewage networks do not intertwine in countries in the West. 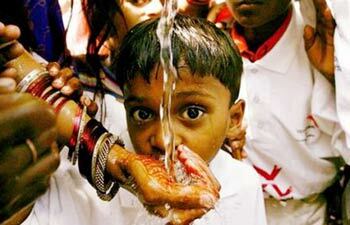 "In India, there is no provision of reviewing drinking water. In the US, the water quality of the source reservoir is reviewed every month and the results are sent to each resident. This should be done in India, too, to ensure that the quality of potable water is maintained," Dr Misra pointed out. Bacteria and virus in drinking water can be controlled with proper chlorination.